Yes. We are fully insured with liability and worker’s compensation insurance. What is the discoloration on my siding? Most of the unsightly discoloration on your siding comes from mildew and algae. You may also be seeing the leftover residue from insects and spiders webs. All of this will be removed when we clean your siding. What are the small, raised, black dots on my siding? The black dots on your siding are most likely spores from a ground-growing fungus called Shotgun or Artillery Fungus. This fungus is usually found growing in the mulch around your home. The fungus shoots its spores into the air fifteen to twenty feet. Once the spore hits your siding it attaches to it. Removing these spores is extremely difficult and time consuming. There are no known products that are effective in removing them. We cannot guarantee that these spores will be removed when we clean your siding. The best way to fight this problem is to remove your mulch and replace it with a different type of ground cover. Will pressure washing my siding damage my siding or leak water into my house? 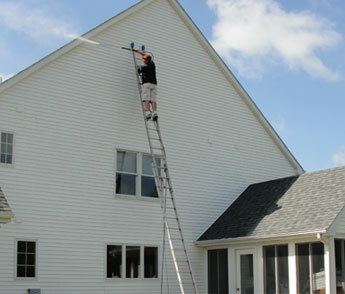 We employ a method of siding cleaning called “soft washing”. Soft washing basically means that the cleaners do a lot of the work. 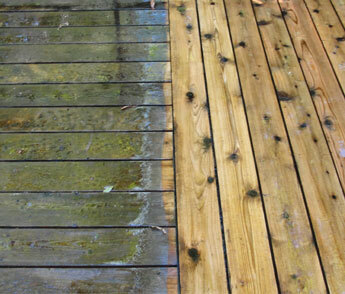 As much as possible, the pressure washer is used as a stiff rinse as opposed to blasting away at your siding. 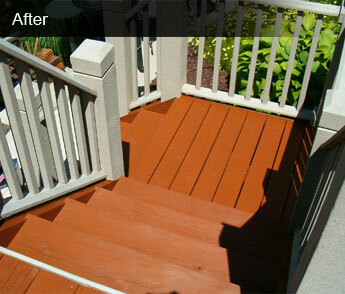 At times there will be certain types of siding staining that may require a little more force with the pressure washer. In these situations we always spray in a way that does not force water behind your siding. What are the black streaks and marks on my gutters? The black marks on your gutters is a type of staining caused by electrostatic bonding. When water runs off your roof, a little bit splashes onto the gutters and runs over the edge. The runoff from the roof carries small particles in the water and electro-statically bonds to the gutters causing the discoloration you see. These stains do not come off with conventional cleaners or pressure washing techniques. The stains can be removed but often require hand detailing and scrubbing to eliminate. We are experts at removing these stains. Will having my siding cleaned harm the vegetation around my home? Your plants are safe from harm with the cleaning chemicals and techniques we use. If certain vegetation is susceptible to the cleaning process we either cover the plants or water them liberally. Harm to vegetation due to cleaning the siding has never been an issue. Can you restore my deck to a like-new appearance? Yes. 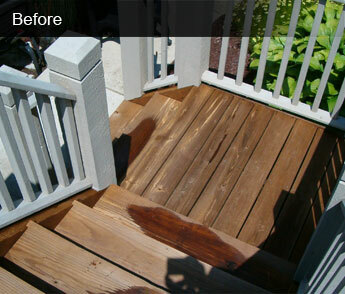 The gray discoloration of wood is caused by dirt, mildew, and oxidation. 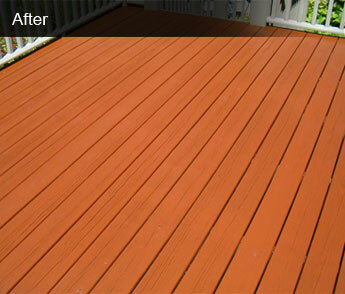 Properly cleaning the wood will bring out the natural color of new wood. Do I have to seal my exterior wood sufaces? Although it isn’t necessary to seal your exterior wood for it to function, properly sealed and maintained wood lasts significantly longer and is aesthetically very pleasing. 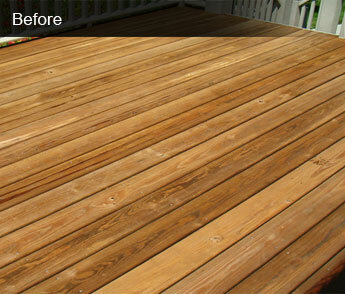 If you only have your wood cleaned without sealing it, the wood will quickly turn back to the dirty, gray color. Generally, horizontal surfaces will last approximately two years while vertical surfaces will last approximately four years. These approximations can vary significantly based on the type of weather and exposure the wood receives on a regular basis. What is the black discoloration in my concrete? 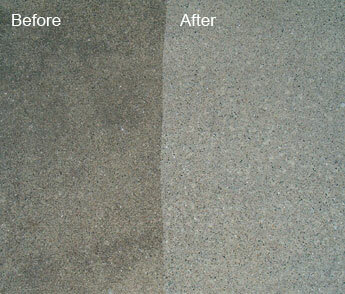 The discoloration in your concrete is usually a combination of mildew, algae, and lichens. You may even notice it starting to turn green. 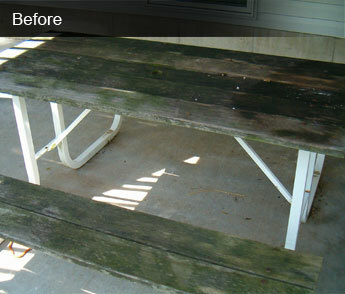 Our cleaning process completely removes this staining. 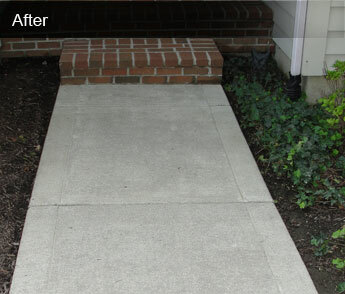 You will be surprised how clean your concrete will look. Can you clean the oil stains on my driveway? 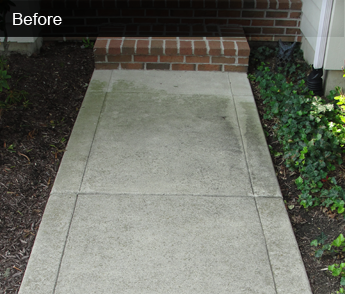 Due to the porous nature of concrete some stains cannot be completely removed. 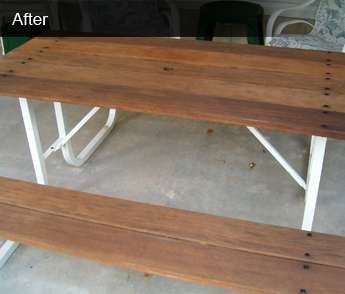 Our cleaning process will greatly reduce the oil stain but you may still see a gray shadow. Most oil-based stains in concrete will breakdown over time even if you do not have it cleaned. We can speed up that process significantly. Why should I consider having my concrete sealed? When your concrete was first poured it was immediately coated with a cure and seal product to help harden the surface to resist chipping. This sealer will wear away over time and expose your concrete to the harsh attack of the freeze/thaw cycle during the winter months. If you notice the surface of your concrete starting to chip away, it is time to apply another coat of sealer before the next winter. My concrete is relatively new and is beginning to chip away quickly–why? If concrete is poured on a very hot day it runs the risk of the surface moisture evaporating before it can cure properly. When this happens the surface of the concrete cannot resist the freeze/thaw cycles of the winter months as well as concrete that cures properly. The only way to combat this is to make sure the concrete is sealed frequently. How often varies from house to house. Will treating my cedar roof damage it? Before doing any work on a cedar roof, we look at the general condition of the shingles to see if they are able to withstand the cleaning process. Often cedar roofs are left untreated for long periods of time and begin to soften and rot. When this damage becomes excessive, it is usually more productive to have the roof replaced. If the shingles are in good shape, there should not be any adverse affects from cleaning and sealing. How often should I have my cedar roof cleaned? Cedar was chosen for exterior wood structures due to its natural resistance to rotting. As long as cedar is exposed to the elements these anti-rot qualities perform well. The worst thing for cedar is to let the shingles become covered with debris or moss. When this happens, the wood cannot breathe and begins to rot. Each roof is different and has to be judged based on the environment it is surrounded by. 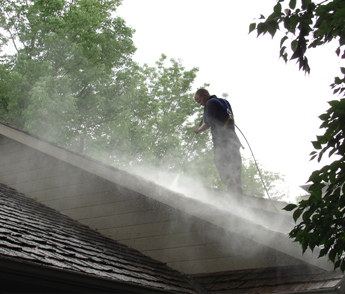 A good rule of thumb is to have your roof cleaned and sealed every 5 years. What type of sealer should I seal my cedar roof with? Cedar must breathe in order to maintain its longevity. This requires that any sealer not be a film-forming sealer. 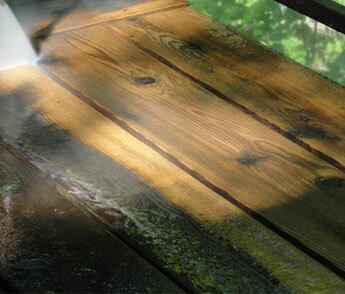 Most quality penetrating-oil sealers work well on cedar roofs and come in a wide array of colors. This has to be determined by the amount of trees and their proximity to your home. 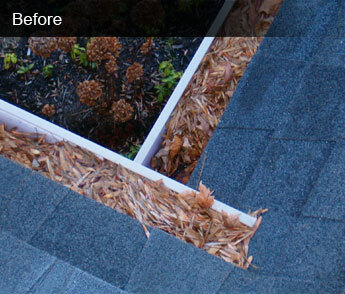 If you have significant tree coverage, cleaning your gutters every spring and fall would be ideal. If I install gutter guards will I have to clean my gutters again? There are a wide variety of gutter guards to choose from, and each provides its own level of protection. 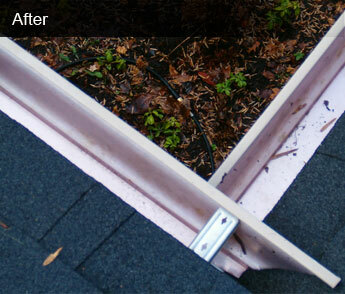 A standard, grated gutter guard should keep your gutters clear of debris for several years. Some of the more advanced sloping gutter guards will keep your gutters clear of debris permanently. Much depends on the amount of tree coverage you have near your home.